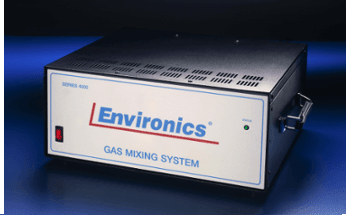 The Environics® Series 6100 Computerized Multi-Gas Calibration System is a computer controlled, advanced instrument for dynamic multi-point gas calibration of ambient air analyzers. Both in service and new Series 6100 can be optimized for low levels of ozone, down to 2 ppb repeatably at no extra cost! 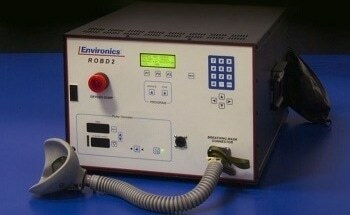 For in service units, we optimize the calibration and no new parts are required. 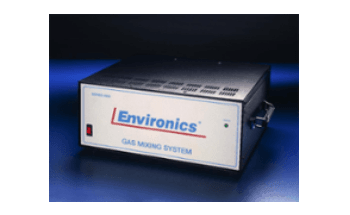 The Series 6100 automatically carries out zero, precision, span and multi-point calibrations using hydrocarbons, SO2, NO, NO2, CO, O3 and other gases of interest. 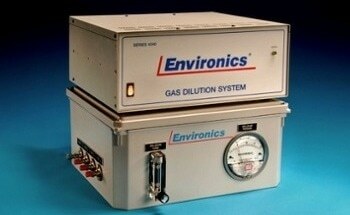 The Model 6100 complies with all U.S. Environmental Protection Agency requirements. The Series 6100 has a single chassis supporting up to three thermal mass flow controllers, an ozone generation module, a reaction chamber for gas phase titration, a mixing zone and control electronics. Commands are keyed from the front panel and displayed on a backlit 4 line by 20 character liquid crystal display. The instrument can also be remotely operated using the RS-232 serial data interface or contact closures, both are standard in the Series 6100. The Model 6100 is equipped with two mass flow controllers, but a third can be integrated to support a larger range of dilutions. The mass flow controllers are calibrated to a National Institute of Standards and Technology (NIST) traceable primary standard. The calibration data consists of a comparison of desired versus actual flow over the entire dynamic range of the instrument with linear interpolation between points. 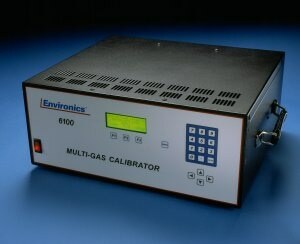 Calibration data is stored in non-volatile memory and may be updated by the user with an appropriate standard. The Series 6100 ozone generator is factory calibrated according to a NIST traceable ozone standard. This temperature controlled, UV-based ozone generator includes a precision photo-optical feedback circuit to compensate for lamp aging effects. The Series 6100 is offered in either a regular rack mount or portable configuration. Both in service and new units can be optimized for low levels of ozone, down to 2 ppb repeatably to meet 40 CFR Part 58, Appendix A requirements at NCORE and trace sites! Internally-stored mass flow controller calibration data enhances accuracy by as much as a factor of ten and streamlines field recalibration. Mass flow controllers are factory calibrated at 11 points. 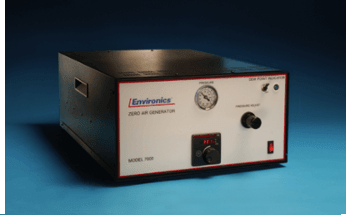 Ozone generator pressure compensation guarantees repeatable and stable ozone generation at pressures other than the original calibration pressure. 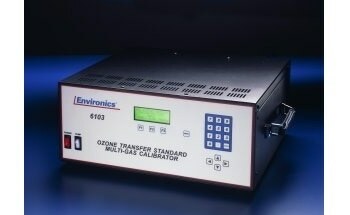 Internally-stored ozone generator calibration data insures linear, repeatable ozone generation without photometer control. Ozone generator performance complies with U.S. EPA criteria for ozone transfer standards. Complete, two-way RS-232 Serial Data Interface (standard) allows remote operation of the instrument including data collection, initiation of zero, gas selection, span and multi-point calibrations. Concentration Mode: In response to software prompting, user chooses gas port, span (cylinder) gas concentration, output gas flow (total) and output gas concentration. 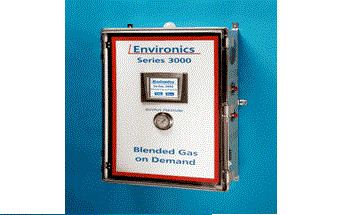 Series 6100 automatically offers concentrations at the total flow specified. 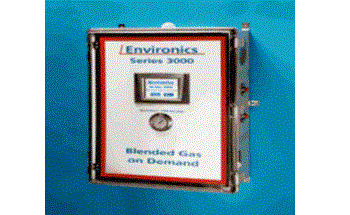 Display: Allows user to monitor flow rates for each mass flow controller individually. 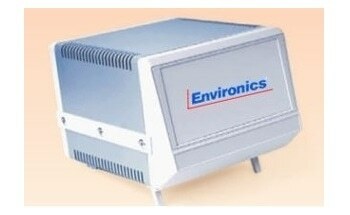 Also offers ozone oven block temperature during generate ozone and gas phase titration routines.